GEORGE HOAR (1826-1904). Hoar was a Massachusetts lawyer and a United States Senator and Representative. GEORGE HOAR. TLS. 1pp. 8" x 10 1/4". Washington, D.C. January 14, 1896. 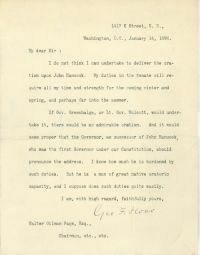 A typed letter signed "Geo F. Hoar" to "Walter Gilman Page": "I do not think I can undertake to deliver the oration upon John Hancock. My duties in the Senate will require all my time and strength for the coming winter and spring, and perhaps far into the summer. If Gov. Greenhalge, or Lt. Gov. Wolcott, would undertake it, there would be an admirable oration. And it would seem proper that the Governor, as successor of John Hancock, who was the first Governor under our Constitution, should pronounce the address. I know how much he is burdened by such duties. But he is a man of great native oratoric capacity, and I suppose does such duties quite easily." The letter is glued down to a board and is in fine condition.